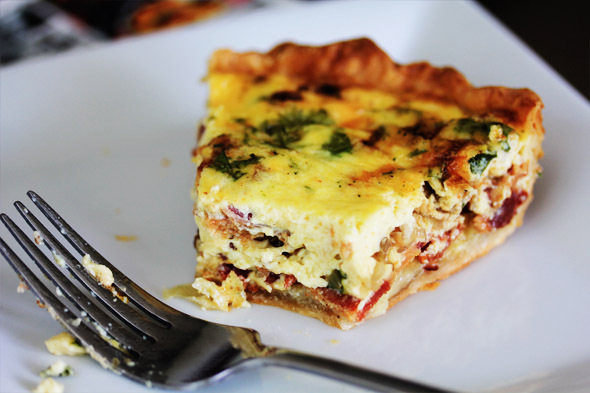 Recently, I whipped up a delicious brunch that included this uh-may-zing quiche filled with smokey bacon, delicious gruyere cheese and a hint of sweetness from the shallots. Served it alongside a fresh green salad and lots of fruit — it was a pretty epic meal. 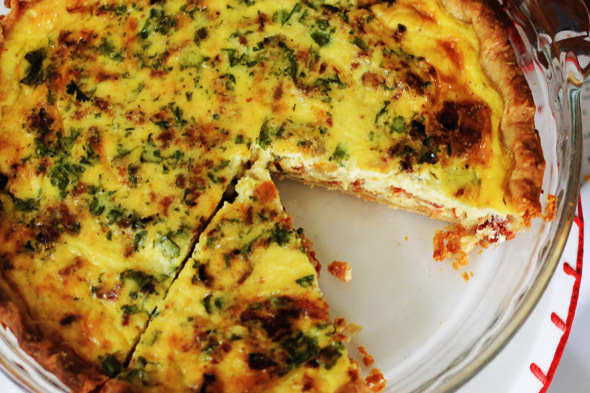 If you’re a lover of quiche, you gotta give this recipe a try. 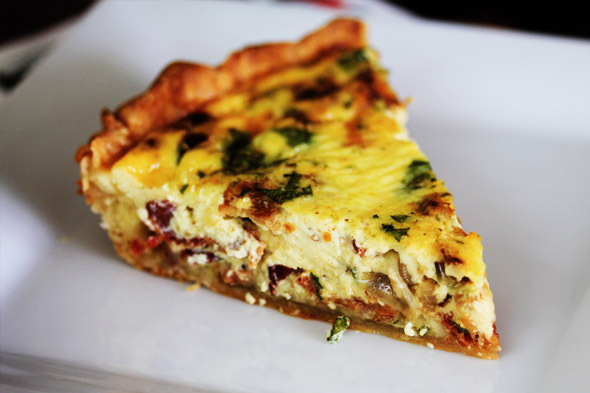 This quiche is a spin on the classic Quiche Lorraine. 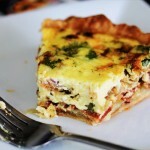 I added a few more things to it, so it’s no longer a typical Quiche Lorraine, but still damn good. 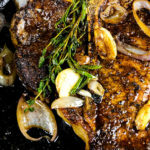 It turned out to be beautifully tender, with the perfect texture and richness. The milk and heavy cream combination truly makes it great. You could use just milk, or milk + half & half, but I cannot promise you’d get the same texture or outcome as the milk + heavy cream duo. 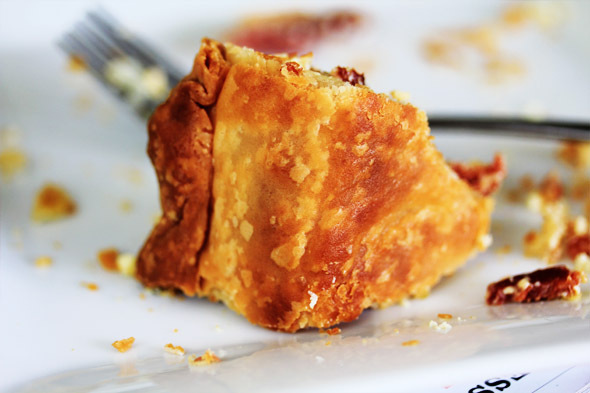 The crust was flaky, buttery and extremely easy to make. 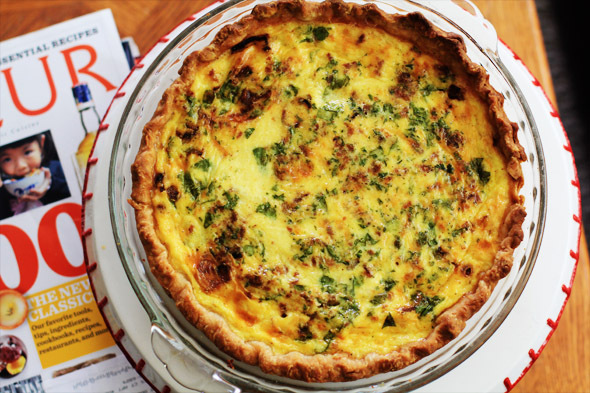 When I made this quiche, I had to use a Pyrex pie dish without the lip/edge, so my dough sank a little 🙁 Dah well, it still turned out great. I made my pie dough a day ahead, but you can make it the day of — just give it some time to chill in the fridge and tighten up a bit before you roll it out. As far as the bacon goes, depending on how thick, wide or long your bacon slices are, you may wanna use your best judgement as far as quantity goes. Too much bacon and it will turn out very salty. I used six slices of bacon that was pretty wide and hefty, but not exactly “thick-cut”. It gave me the perfect amount of saltiness, but had I used just two more slices, it would have been too salty. I will give you a bit of leeway with the bacon measurement in the recipe below. 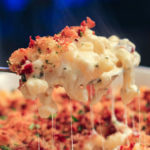 At the same time, too much cheese can make it too salty too — so tread carefully guys. You can always add salt but you can’t take it away. 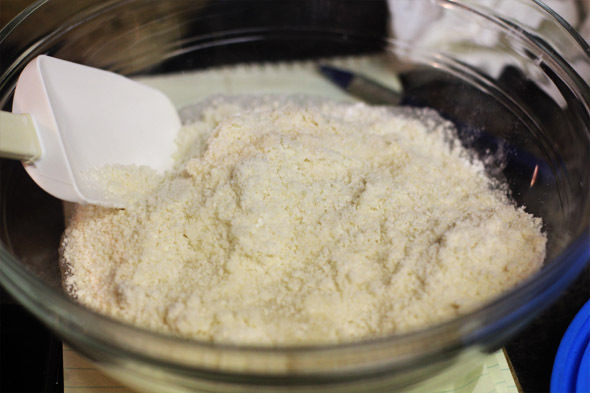 Pie dough flour mixture should be crumbly like coarse cornmeal, like this. Transfer the mixture to a bowl and add the water. Gently fold and press the flour with a rubber spatula until it comes together like this. Form and shape into a disc and refrigerate for at least a half hour. Snip it, shape it, tuck it, flute it. All ready for the freezer and refrigerator. 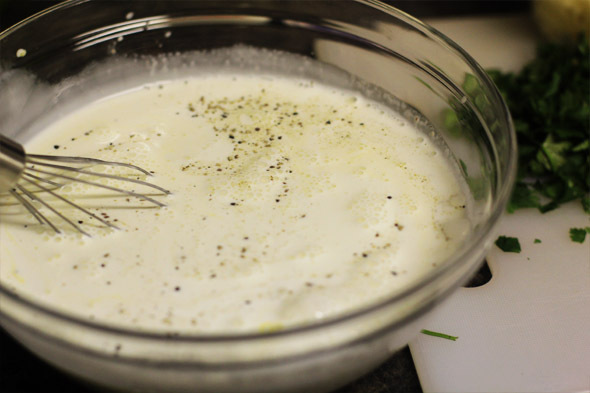 Then the bacon, shallot + garlic, parsley and then finally pour the custard over all of it — gently. Sweet Jesus, this was so good. So so soooo good. I’m looking for the nearest excuse to make this again…and again and again. pie dough recipe adapted from cook’s illustrated. 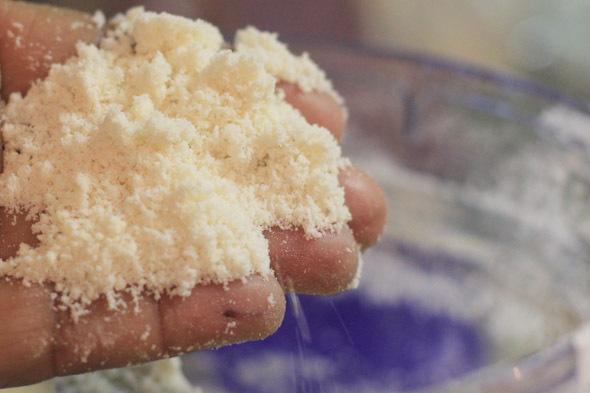 In a food processor, pulse the flour, salt, and sugar until combined. Place the butter pieces over the flour mixture and toss to coat. 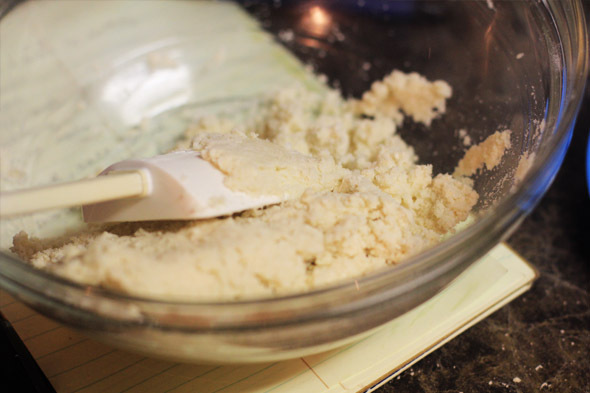 Cut the butter into the flour with about five pulses. Add the shortening and continue pulsing until the flour is pale-yellow and looks like coarse cornmeal, just a few more pulses. The butter bits should be no larger than small peas. Pour the mixture into a medium bowl. Evenly sprinkle 4 tablespoons of ice water over the mixture, and fold the dough with a rubber spatula to bring it together. Fold and press down with the spatula until the dough sticks together. Add another tablespoon of ice water if you need to, until it comes together. Work quickly if it’s warm in your house so that your butter doesn’t get too soft — which isn’t good for pie dough. 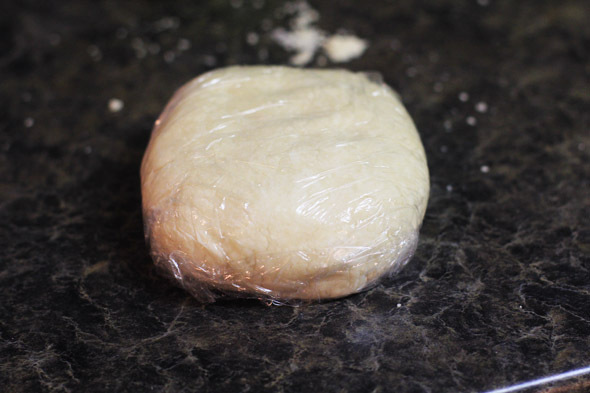 Shape the dough into a ball until it’s cohesive, then flatten it into a 4-inch wide disk. Dust it lightly with flour and wrap securely in plastic wrap. Refrigerate for at least 30 minutes, or up to 2 days before rolling out. When you’re ready, remove the dough from the refrigerator and let it stand at room temperature for about 10 minutes to soften slightly, just until its easier to work with. If you kept your dough in the fridge longer than 30 minutes, it may need up to 20 minutes at room temperature to become pliable. A good way to test is to squeeze the dough gently — if you can do this easily without applying too much pressure, it’s ready to roll. Roll the dough on a lightly floured surface into a 12-inch circle, about 1/8-inch thick. Gently transport the dough to a pie pan. An easier way to do this is to gently fold the dough in quarters, then place it in the center of the pie plate, and unfold. Press the dough carefully into the corners of the pan by lifting the edges of the dough with one hand and pressing on the bottom of the pan with the other hand. 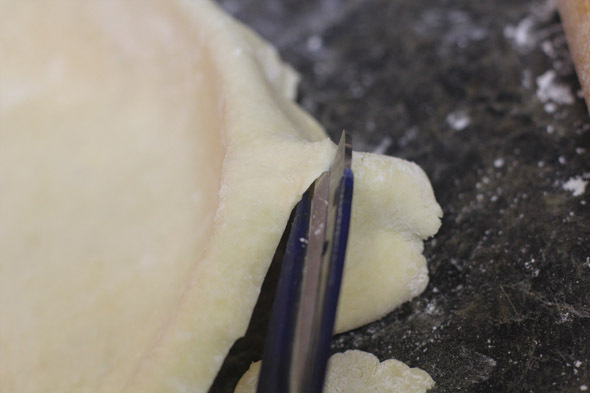 Trim the edges so that just 1/2-inch of the dough hangs from the lip of the pie pan. 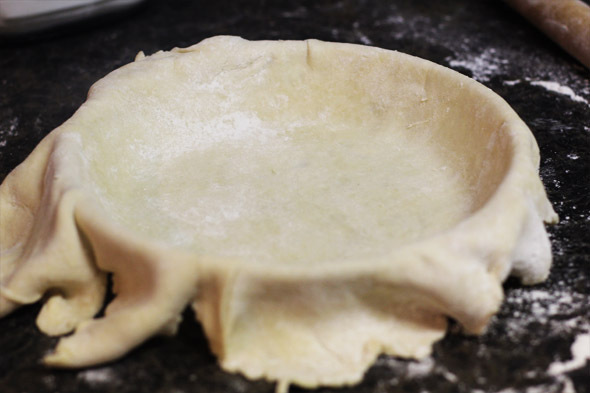 Tuck this 1/2-inch rim of dough underneath itself so that the folded edge is slightly beyond the lip of the pie pan by about 1/4-inch. Flute the edges of the dough however you’d like. Refrigerate the pie shell for 40 minutes and then freeze for an additional 20 minutes. Meanwhile, heat your oven to 375 degrees with the oven-rack in the middle. 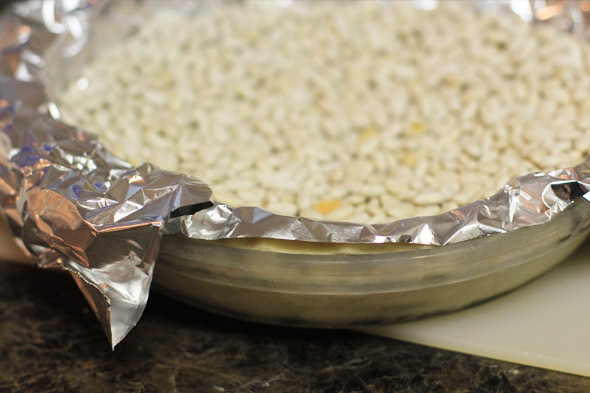 Place a sheet of aluminum foil inside the dough shell and evenly distribute pie weights or dried beans over the foil. Leave the pie weights or dried beans in place and bake the dough until it dries out slighly, about 17 minutes. Carefully remove the foil and weights, and continue baking for about 8-10 more minutes until lightly golden brown. 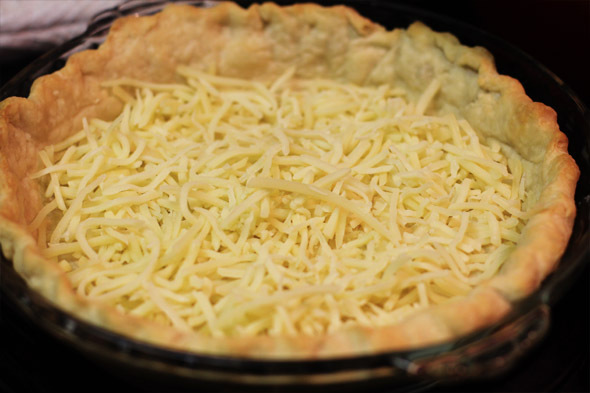 If you’d like a fully baked crust, continue baking for about 15 minutes longer, then let cool. This is called “blind baking”. 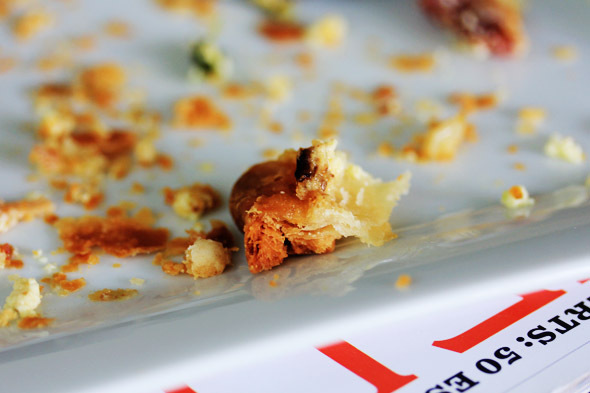 It allows our bottom crust to set up so that it doesn’t become soggy during the entire baking process. The beans keep the bottom crust from rising up, which could totally ruin the dish. Make sure your oven is still heated to 375 degrees. In a large skillet, fry the bacon over medium heat until crisp and brown. 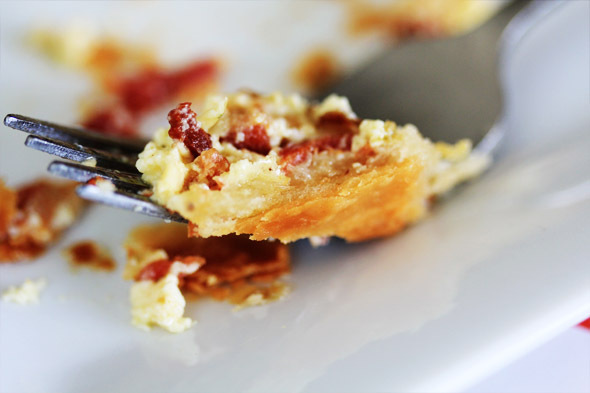 With a slotted spoon, transfer the bacon to a paper towel lined plate to drain. 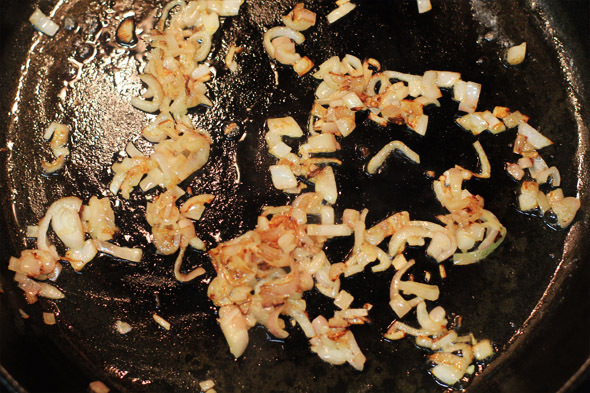 In the same skillet, saute the chopped shallots in about 1 tablespoon of the residual bacon fat until softened and lightly golden brown, about 6 minutes. 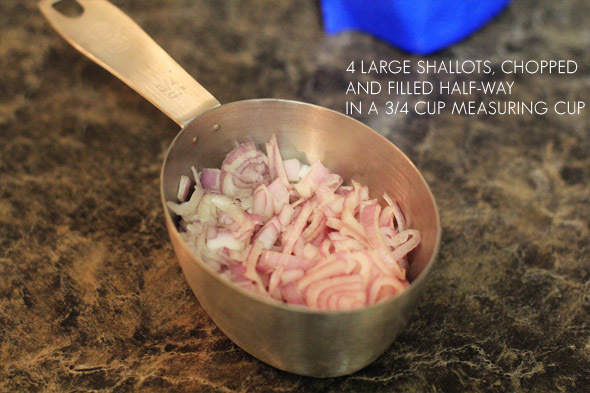 Add the garlic to the shallots and cook for just 30 seconds. Transfer this mixture to a small bowl. In another bowl, whisk the remaining ingredients — except the cheese. 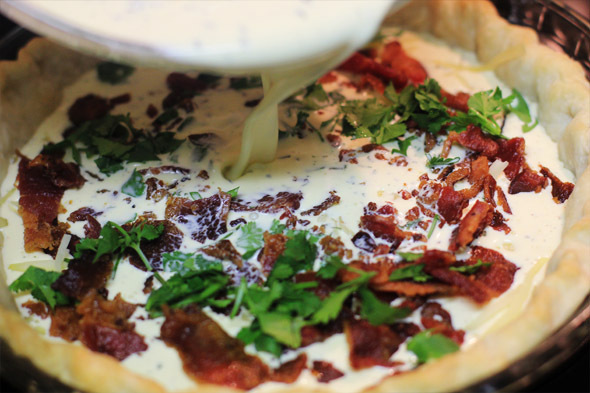 Spread the cheese, shallots, garlic, bacon and chopped parsley evenly over the bottom of the warm pie shell. Set the dish in the oven, then carefully pour the custard mixture into the pie pan leaving about 1/2-inch of the rim visible. 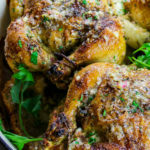 Bake until lightly golden brown or until a knife inserted about an inch from the edge comes out clean — about 30-35 minutes. The center should be soft like gelatin and will continue to set up after it’s baked. 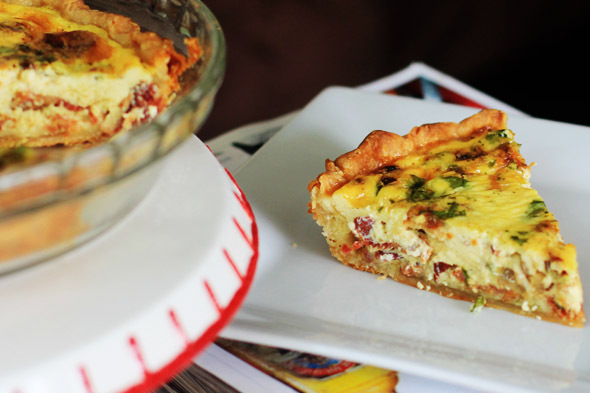 Cool the quiche and serve warm or at room temperature. If you’re using THICK cut bacon, you’ll only need about 4 or 5 slices. If your bacon is thinner, the more commercially available kind, use 6 to 8 slices. Please be mindful that bacon is naturally salty and so is the cheese being used. 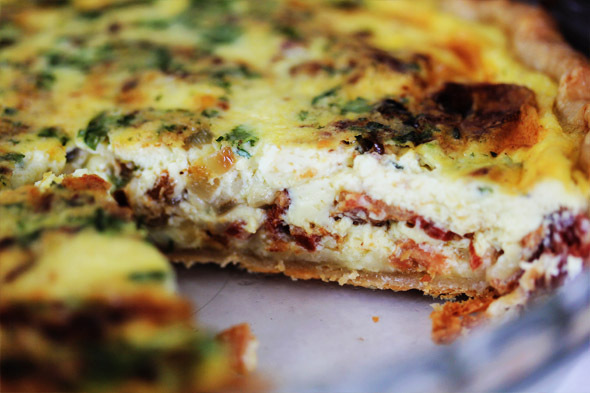 Using too much bacon OR cheese can make the entire quiche too salty. Please use your best judgement, and by all means, taste the filling before it’s baked if you must. 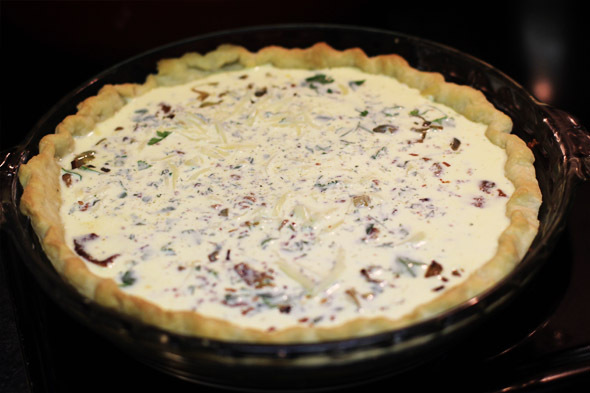 The center of the quiche will be surprisingly soft when it comes out of the oven, but the filling will continue to set (and sink somewhat) as it cools. 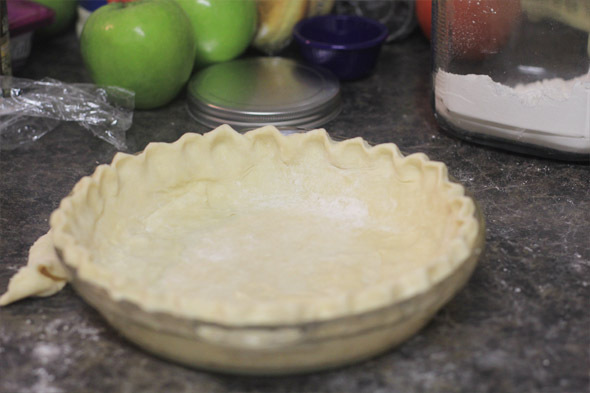 If the pie shell has been previously baked and cooled, place it in the preheating oven for about five minutes to warm it, taking care that it does not burn. 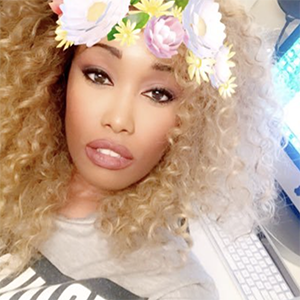 I made this, of course I tweeked it a bit for my own liking and HUNTY! 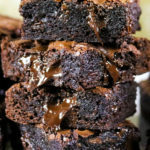 I am in love….I shall be making this again and trying out different fillings. I love this site since you aren’t afraid to explore and try something different. Thanks again! on my way to your house to eat this. This looks delicious! 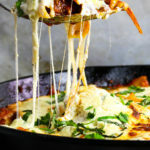 Do you think I could substitute the cheese with fontina? What is the best substitute turkey bacon? or should I even use turkey bacon.. I m making for someone who does not eat swine (help us Lord). just leave it out altogether. turkey bacon is of the devil. Hi! 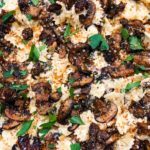 If I am planning on making a couple of days ahead of time for NYE brunch, should I freeze or just refrigerate? Thanks and happy holidays!